You may have already noticed the crocus installation if you’ve glanced up whilst walking by the entrance to the Whitgift Centre in the last week. What does it mean and why is it there, you may have thought. Well, the artwork is part of this year’s Croydon Heritage Festival and will be brightening the skies of North End until the end of July. The festival commissioned multi-disciplinary art and design studio Aether & Hemera to create the piece. The studio, founded by Gloria Ronchi and Claudio Benghi produces work internationally from their base in Newcastle, which crosses the disciplines of contemporary installation, lighting art and interaction design. We caught up with Gloria and Claudio to find out more about our new Croydon crocuses. Croydonist: How did you get involved with the Croydon Heritage Festival this year? 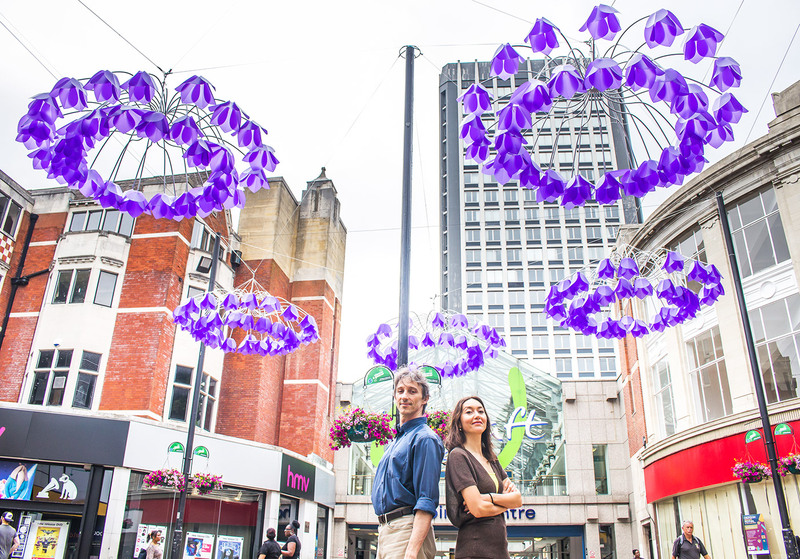 Aether & Hemera: The Whitgift Foundation invited a number of artists to propose an idea for an artwork for this year’s Heritage Festival, based on Croydon’s history and heritage; we were delighted to hear that we were shortlisted and then commissioned to create our piece ‘Crocus Valley’. 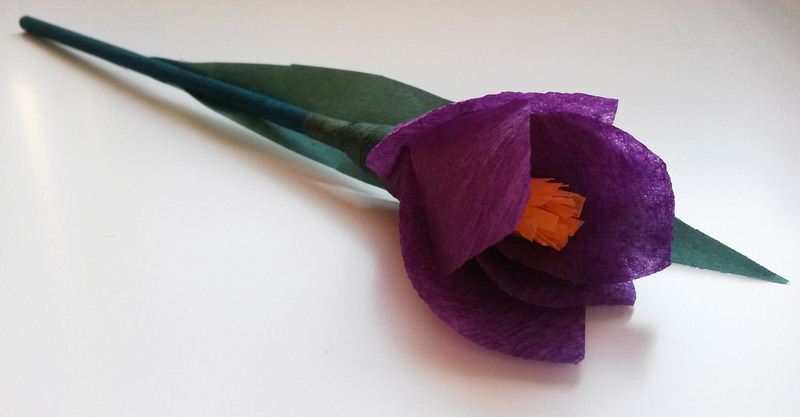 Croydonist: What was your brief and how did you settle upon the origami crocus installation as the solution? Aether & Hemera: The name Croydon is thought to stem from the Anglo-Saxon words ‘Croh-Denu’, meaning ‘valley of the crocus’ – suggesting that it may have been a site of saffron production in Roman Times. So the brief asked us to take this as the starting point for an artwork which engages the community and delights visitors during the festival. We have used origami in the past, for instance in our installation Voyage – an interactive installation that consists of three hundred floating origami boats, encasing dynamic LED lights that change colours based on people’s interactions. 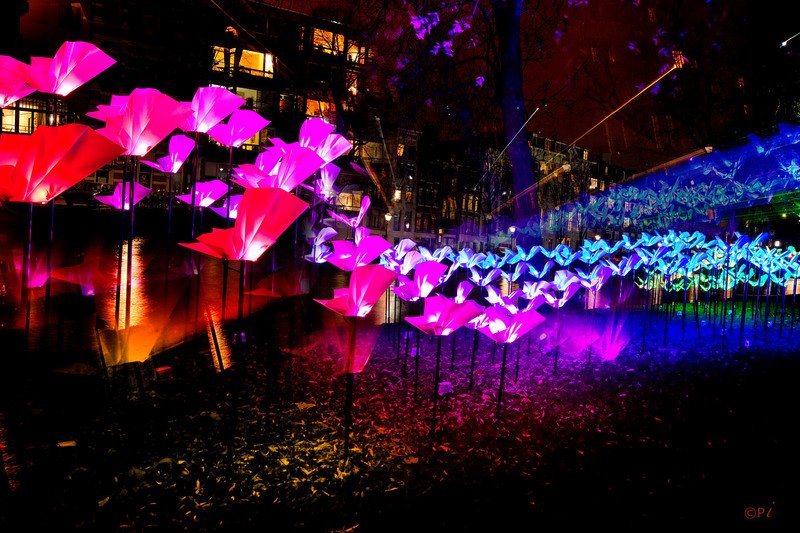 Or in our work On the Wings of Freedom (below), a swarm of dozens and dozens of origami butterflies that also creates an array of RGB LEDs choreographed for rich lighting effects. For us, origami is also metaphor of hope; their power is transformation, shape shifting and evolution, which is also this year’s festival theme. Croydonist: What sort of research did you do for ‘Crocus Valley’? Aether & Hemera: We visited Croydon several times, including a fascinating trip to Saffron Central to help develop our concept. Our aim was to create an artwork that could provide an accessible entry point for people to reflect and discover more about Croydon’s history and heritage; this piece also explores public art creative and artistic potential to express ideas, emotions and surprising encounters. Croydonist: We hear you also ran workshops as part of the research process. Who were they with and did they inform the final design? Aether & Hemera: We ran workshops at Whitgift House, at Old Palace School and at Studio Upstairs. The workshops informed our decision about the colour of the artwork and also the idea of creating the pistils of the flowers using orange cable ties. 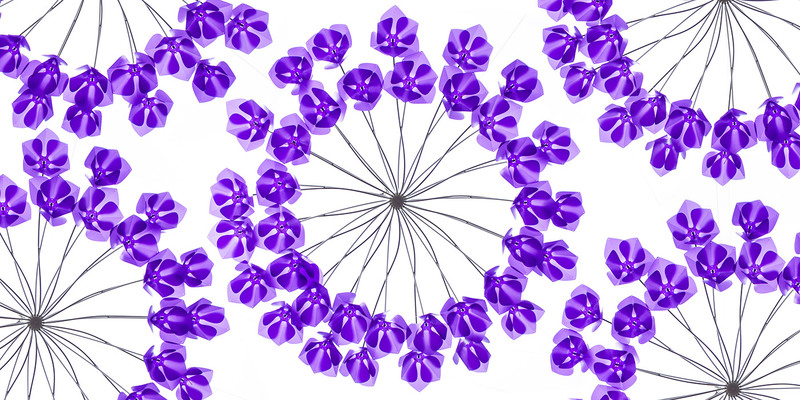 Crocus colours vary enormously, although yellow, purple, and white are predominant; we decided to go for an ‘all purple’ installation because after the workshops we felt that the association of purple was very strong in Croydon. Croydonist: Not being Croydon residents, what’s been your favourite Croydon haunts when visiting? 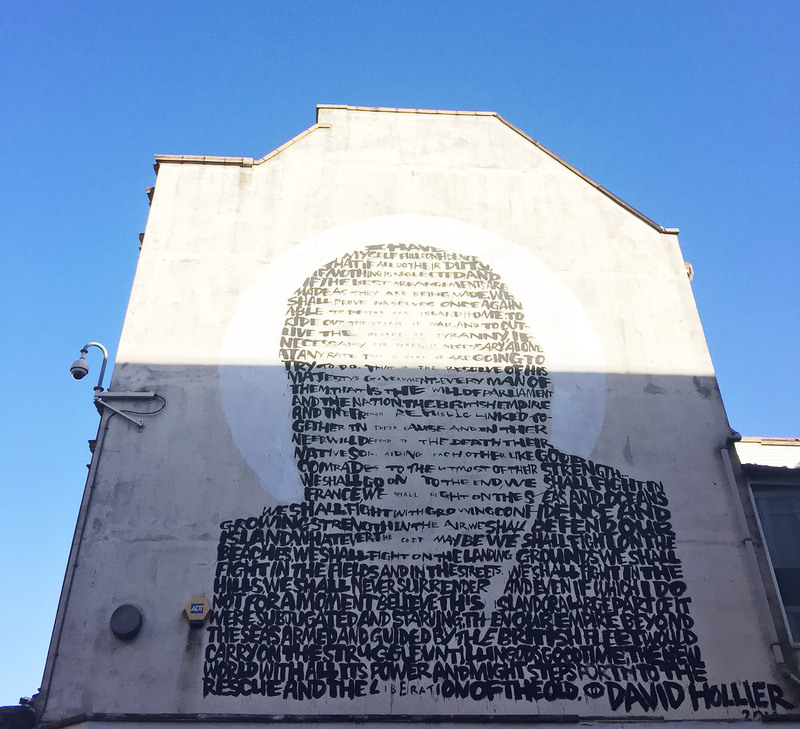 Aether & Hemera: We love the giant mural of Winston Churchill, it is quite intricate and every time we passed in front of it, we couldn’t help but stop to admire it. It was always sunny during our visits to Croydon, and we enjoyed eating outdoors at the Smoothbean and also at Boxpark; we also loved our visit to the nearby Mayfield Lavender Farm. Croydonist: Can you tell us the meaning behind your name? Aether & Hemera: Aether and Hemera are the ancient Greek god and goddess of brighter upper air and daylight; since we are keen to look at the ways in which colours and light (either natural or artificial) can interact with each other and with the viewers, we thought that this name was reflecting our studio practice and interest. Croydonist: What’s next for you guys? Aether & Hemera: We are collaborating with mathematicians Dr Lombardo and Dr Huard from Northumbria University to create an installation as well as delivering outreach workshops inspired by their fascinating research on nonlinear waves – thanks to an EPSRC grant. Croydonist: We wish you good luck with your next project. This year’s Croydon Heritage festival finishes this friday, 30th June, but you can see ‘Crocus Valley’ until the end of July. Thank you to Gloria and Claudio for chatting to the Croydonist. Article images 3, 4 and 6 courtesy of Aether & Hemera, article photo 1 by Rob Wilson Jnr at Fluid4sight / courtesy of The Whitgift Foundation, article photos 2 and 5 by the Croydonist, header montage by the Croydonist with photos by Rob Wilson Jnr at Fluid4sight / courtesy of The Whitgift Foundation. I haven’t seen it yet. Going tomorrow. I love the way it rotates so gracefully!